It looks like Symi is continuing to be my nightmare! Some years ago we were there at Greek Eastern time not knowing what to expect: at 00:00 on Easter Sunday the locals were throwing dynamite into the harbour and we were quite scared. So I only went there once again and had problems again with crossed chains. This time I thought I might get more luck. The first morning a polish charter boat skipper, who did not get tired of repeating he would be a professional skipper, was going in circles while trying to get his anchor out, screwing some other anchors like mine. 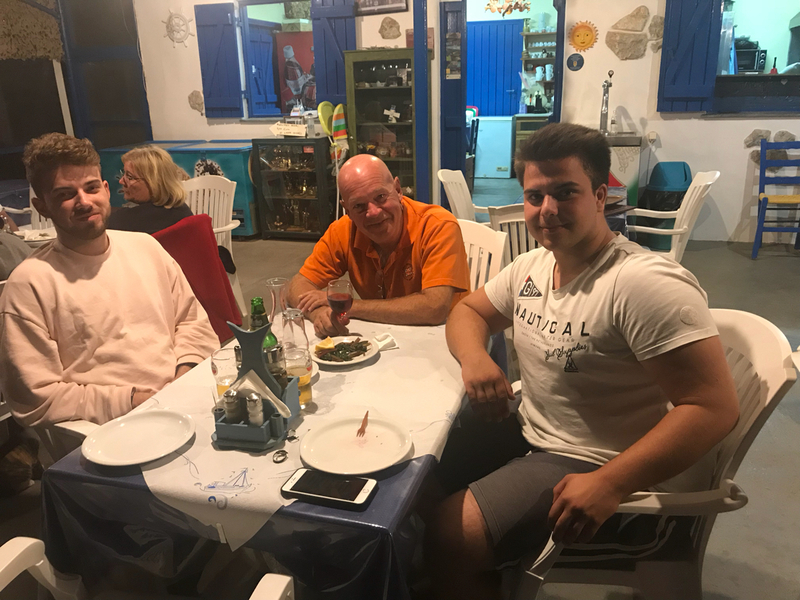 Michalis, the local diver had to take my chain of the anchor to clear the mess. 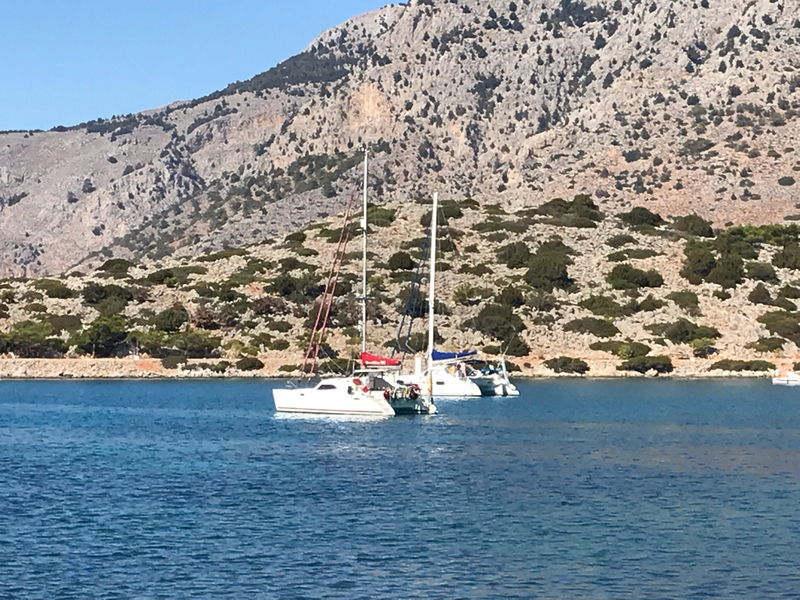 Now I am anchored in Panormitis in the South of Symi waiting for the weather in Kos to calm down tomorrow. To get away from the cold northerlies I decided this morning to head south to Symi for a few days. Winds are up to 27 knots but gladly from the stern. 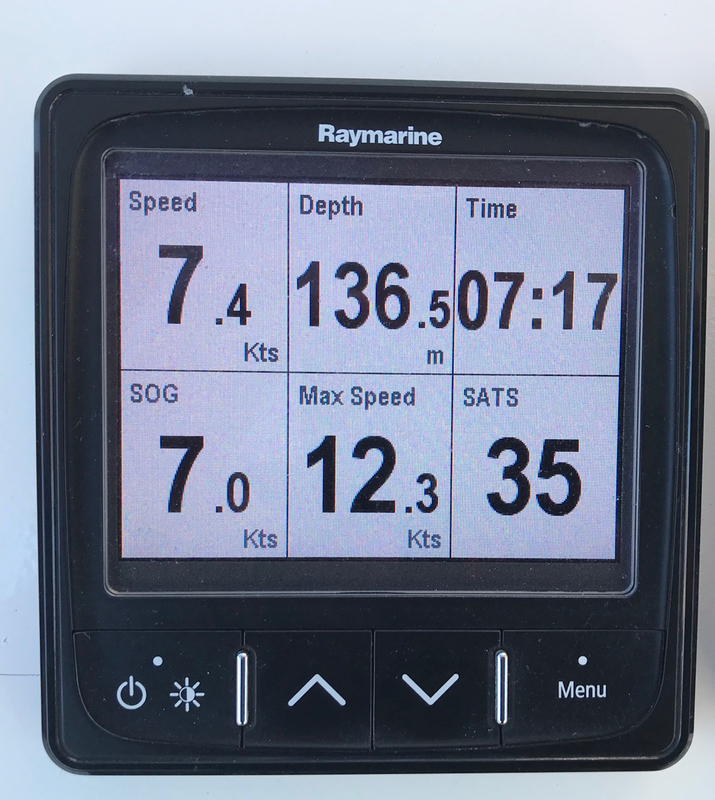 Until Knidos it was more of a surfing than sailing with a max speed of 12.3 knots. Not bad for a 12 meter catamaran. A new experience for my son Nicolas and his friend Michael: no internet! On our way to Palionissos we first caught two plastic bags and we already thought, that would be it. 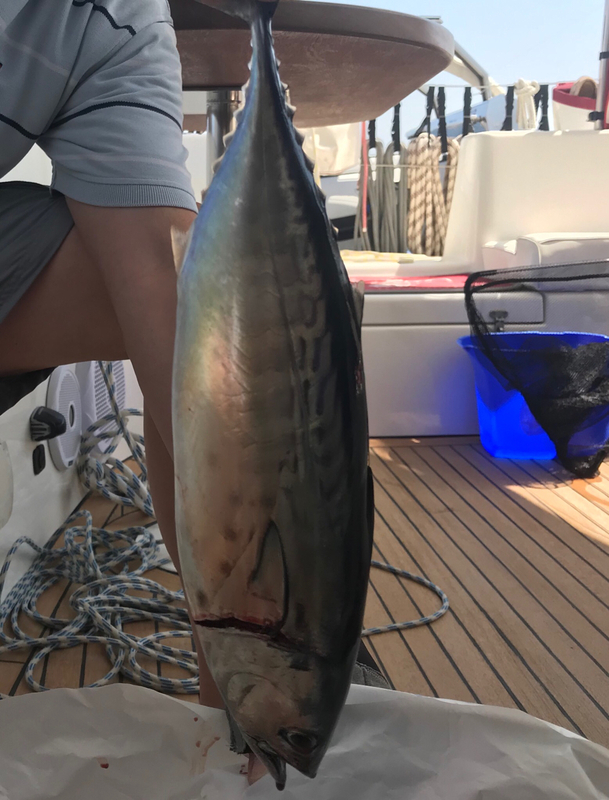 Than finally south of Pserimos a 600g Bonito got on the hook. So Christos will have something for the barbecue tonight. 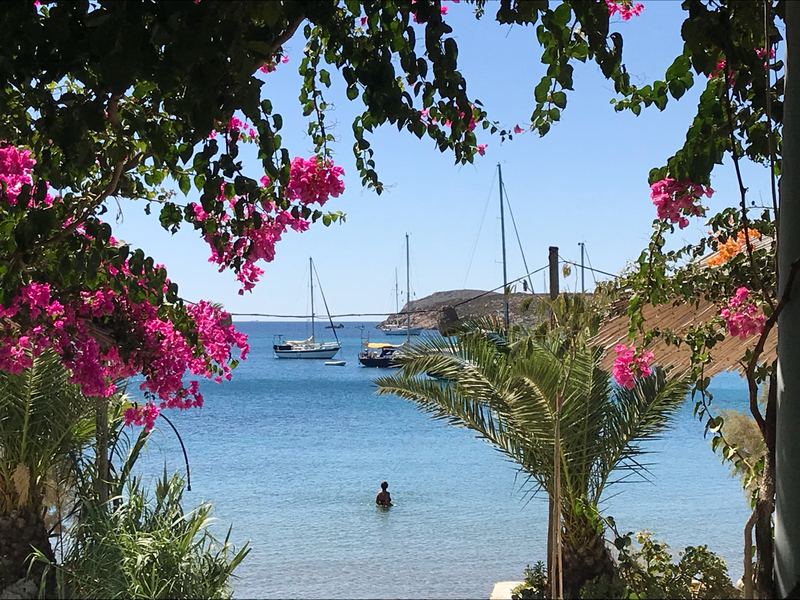 In the lovely bay of Lera on the island of Lipsi there is one of my favorite tavernas, Dilaila. After 2 very windy days in Arki the wind drops today and we continue our trip back to Kos. Yesterday morning we moored safely in Arki at the last available place. Just before I called Manolis Trypas to make sure, there is space. In the afternoon it got quite busy as a seldom guest came to Arki - the Hellenic Coast Guard. 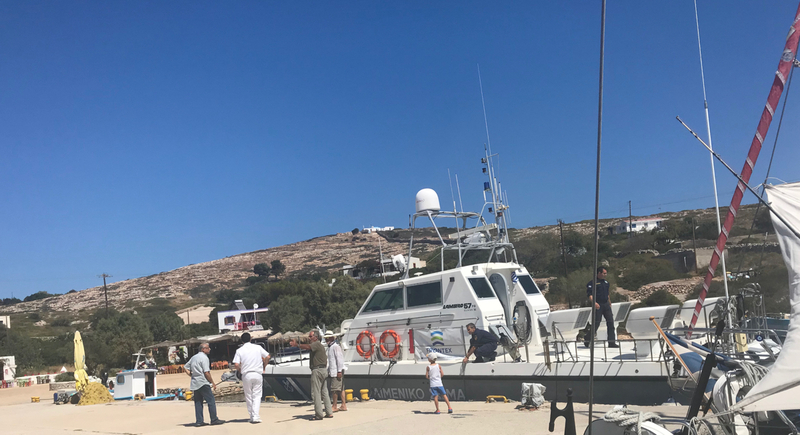 First we thought, that they start checking for illegal entry to Greek Waters and even one boat had to move to give more room to them. About 1 hour later there was another Coastguard ship arriving delivering the mayor of Patmos followed by a SAR ship carrying a minister from Athens. Hopefully nothing happened at sea as the politicians used all the available boats. 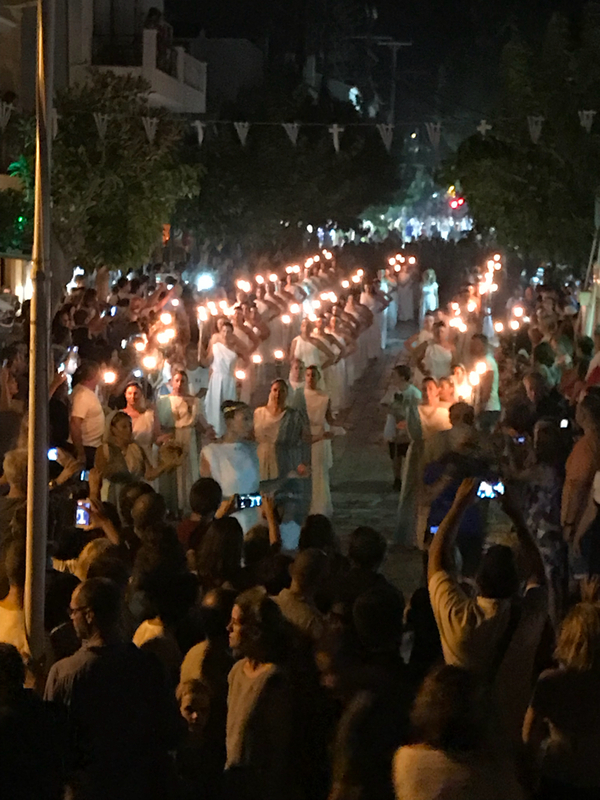 Our stop in Pythagorion was topped in the evening by the Iraia Festival in the harbour of Pythagorion. From the bimini top we had a great spectators view. Haraia was the biggest festivity in ancient Samos celebrating the birth of goddess Hera, who according to the myth was born in Samos under the leaves of an osier tree. Later she got married to Zeus..